Performing a physical diagnosis is easier with Welch Allyn's medical diagnostic instruments featuring our exclusive Halogen HPX™ lamps that provide brighter, whiter light than standard halogen lamps for true tissue color and long-lasting illumination. 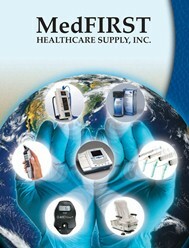 Built for durability, ease-of-use and comfort, these instruments will provide you with lasting satisfaction. • 3.5V Coaxial Ophthalmoscope with patented coaxial optics offering a greater field of view, shadow free spot, and easier entry into the patient's pupil. Special polarizing filter reduces corneal reflection by 99%. 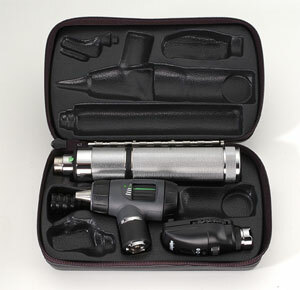 • The 3.5v MacroView(TM) Otoscope with throat illuminator provides 30% more magnification and twice the field of view of traditional otoscopes, along with the ability to adjust the focus. • 3.5V Direct plug in handle, with chrome-plated brass knurled finish, features a long-lasting rechargeable NiCad battery.